"...After driving on the turnpike for several hours, I exited at Utica, New York. We bypassed the city, and when we crested a long hill, the Adirondacks rolled out in endless summertime greens of pine and maple covered mountain ranges before me. My breath caught as if I were at the top of a Ferris wheel. Beautiful, wide open wilderness filled the horizon. Somewhere in all those layers of mountains, further than I could see, was my destination. The road ahead was full of steep climbs, hairpin turns, and pristine forests. Emotions swelled inside my chest. My throat tightened; it was more than a summer vacation. Those mountains symbolized my personal mountains of loneliness and feelings of abandonment. I had been praying since April for contentment, but it seemed like God had remained silent on the matter. I couldn’t see my destination, my comfort, or any sort of future. I wasn’t even sure if such things existed for a widow. My oldest daughter, Brooke, had been married just days before. The wedding had been beautiful, and I was delighted with my new son-in-law. All the planning had gone well, but I was emotionally spent. Seeing the Adirondacks overwhelmed me. I can’t imagine how Naomi felt as she gazed from the plateau of Moab down to the peninsula of the Dead Sea she’d have to cross. 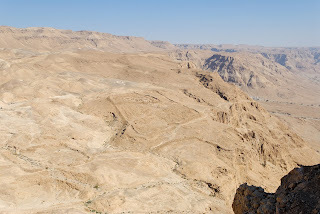 Her view held little greenery and no fresh water along the barren shores of the Dead Sea and up the rugged switchbacks into the Judean wilderness. I wondered, Did she feel as apprehensive as I do? Did she have personal mountains to cross too?..." More pictures of the Judean Wilderness that Naomi, Ruth and Orpah prepared to journey through can be viewed at http://www.bibleplaces.com/judeanwilderness.htm Naomi knew what lay ahead because it was the same route she and her family had taken to Moab. How do you think Naomi felt about going through this wilderness again? You read about the mountains of loneliness and feelings of abandonment I faced. What sort of mountains and challenges do you face? With God, are these “mountains” just part of the scenery along the way, or are they our destination? May I look back on these days and see that you made me strong and this path is your good and perfect will for me. Please turn my path according to your truth and give me the strength to keep going. The loneliness of intimacy is the biggest. Then there are the mountains of just sweet simple everyday things (I miss) like - shopping for a new shirt, or buying a favorite cologne. The gentleness of his smile and laughter, trying out a new recipie I had prepared. It isn't even the holidays so much as it is just the ordinary simple things of everyday life. Naomi must have been remembering in her mind her family's first trip to Moab. Were their sons playing, laughing, asking 'how much further?' Were she and her husband holding hands as they walked, planning a happy future, not worried about anything because they had each other?